You know today every person is trying to become a YouTuber. Or Girls just editing videos for uploading it on Insta, Like app etc. If you are also one of that person then this article is for you. In this article, I will tell you how to edit videos. everybody today uses an Android phone. 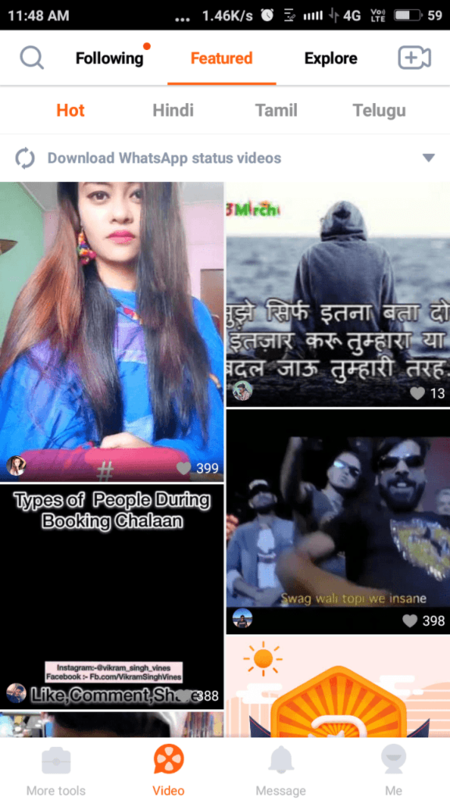 Here in this, I will publish a complete list of Android video editing apps. I have tried to find only best apps for the Android. I will advise anyone who is free to learn proper Video editing. I mean you can create your carrier in this field. On the internet, you will find so many peoples who make money by editing videos. Not on the internet, people who shoot photos in marriage or in the party also edit video. It can be a carrier option only if you master in it. Or If you want to become YouTube then video editing is the must. Look Every video editing app has its own functionality and creativity. I will explain every app. In the end, you have decided yourself which app is best for you. These apps are my personal choice. No company has sponsor me about any app. Many pro YouTubers use this. It is really an awesome video editing software. This has both free and paid version available. I tell you one thing it is not easy to use. But once you will learn it you will love it. It has all the awesome features. You can create a video with the help of 50 different transition effects and animation. I know a YouTuber who has 1 million subscribers use this software to edit videos. In this app you will get all pro features like slow motion, Editing animated Text, Transition, and animation, remove the background, color adjustments, Adding background music etc. I mean you can edit Video easily but while exporting you need the fast processor. Don’t worry if you don’t know how to use it. There are tutorials in this app. The free version is just for learning. You will learn how to edit videos, but when you will produce a video you will get a watermark in the video. Which makes your video really ugly. So I will advise you the to buy the paid version of this app. It is not expensive. it cost around $5.99. Should I buy it? off course If you want to make your carrier in the video editing, youtube. Of course, you should buy this. Another awesome video editor available in the play store. It includes 200 video filter other various effects, transition etc. According to the company, the app has 300 downloads. Like the above app, it has both free and paid version available. It has a 4.5 rating by 10,023,181 users. Just play the above video to know more about this editor. App has pre-built music that you can use while editing the videos. You can use themes, animated stickers, Dynamic text, and so many other features. Filters are common options. It is one of the best video editing app in the Google play store. If you like to do the crazy thing then this app is for you. I mean adding stickers, Dynamic Text etc are used to make our Video unique. In the free version, there is a lot of missing functionality like a watermark, Time limit, Ads, etc. If you all functionality then you have to upgrade to Pro version. Pro version is charge 850 per year. You know the price of the paid version of this app is around $3.99. Which is cheaper than power director. This app is best suitable for those who create short videos, doing crazy things etc. If you love to upload stories then within this app you can download status as shown in the screenshot. You can directly upload these statuses to your Whatsapp, Instagram account. I tell you one thing in the videos you will get only Girls. This is for intermediate users. Who want more functionality and can pay more money. It is used by 200 million users. It will produce HD quality videos. You know this app all common functionality like filtering, selfie camera, Facial Recognition, auto beauty etc. Like other apps you will get tons of features like Trim, themes, Split etc. But this app has one new that I did not find in any other app. That is Pip. I did not pip in any other app. But it is the premium feature. Here are some also other cool things like compression, using which you can compress Video quality to 240p or 320p. Well designed interface and extraordinary functionality make this app different from other apps. You can check preview while editing the video. Actually, in this app, you can full control editing. You can add background music. When you doing work. It is like computer professional video editing software. If you are looking for very basic editing app then you can choose an app. But here I writing about only apps which have some extraordinary functionality. But the biggest Challenge with this app is that in the free version you will get a watermark. If you thinking about buying paid version then you have to pay money monthly or yearly. Which is a really terrible Idea. If you want to edit your Video Quickly then go with this app. This is a very basic editor. In this you can add music and add your photographs then you can edit your videos. I know some people in my area who create videos of their photos and then apply music to it and upload it WhatsApp. This is perfect for you. You can edit your videos super fast. Some simple functions like adding text, cropping are available in this app. It will produce 720p and 1080p videos. You know the best thing about this app is that It comes with auto video creation. This app size is 91mb and it is downloaded 10,000,000+ users and it is used by 729,059 users. I hope you will know how famous is that in the real world. All apps I listed here are top of this category. if you go to play store You will find millions of app. Which will totally confuse you? Another great video editing software available in the Google play store. If you want a free video editor but do not a watermark after the video. Then go with this video editor. In this you will get all basic video features like adding text, You can highlight action and then rewind it. Reply to it etc. Other common things like adjusting color, brightness are the common things. You can add text to the video. Which every video editor have in these days. I know this is not a very famous video editing app but don’t ignore it. Try it once. You will love it. After all, it is a free video editor app in the Google play store. You know filmora is very famous for the video editing on the computer. Many famous youtube creators use it. I use it personally for my own youtube channel. But the video editing app is not great like other apps. Maybe I wish it will be better in the future. This app is free and it has some app for purchases. But I think free features are Good enough for us. But the biggest Challenge with Free is that it will produce a watermark when you produce a video. If you are looking for an easy way to editing Video choose this video editor. The paid version price is $7.99. You know about the abode. They have great software. Every software build by Adobe is just a great. The best thing I like about this software is that it has auto video creation. I mean you have to just select photos to create the video. It will produce a video for you. If you want to edit your videos then you just this is another great tool. You have just drag and drop for Video editing. It looks great. It has Editing functions. To use this software you have to first create an account. So It will automatically project to your account. I was expecting that I will get tons of features because this is adobe but It is not a pro video editor app. That is the thing that makes adobe software makes stand out other. if you looking for something simple video editing apps. Then this video is for you. This is not an advanced video editing app. People who use video editing for uploading on Whatsapp this app is for you. It has all basic functions like adding text, adding music to videos, Cool video effects, adding emoji etc. You can make the video loop. I mean it has all basic video editing stuff that you have to need to do. You know this app is downloaded by 5,000,000+ and it has a 4.5 rating by 439,500 users. Which is the proof of how awesome this app is. I hope you will learn something new from this article. If you are using a video editor that I have not listed then let me know by comments. I will add it shortly. You can also leave a comment to leave your review about this.